Last week, we brought you the unsettling news that there were a handful of creepy clowns stalking the streets of California. Well, we hate to be the bearer of bad news again, but not only has the number of clown sightings on the West Coast multiplied, but apparently murderous-looking clowns stalking quiet towns is a thing. The Wasco Clown wasn't an unprecedented isolated event. I know, I know. Breathe. 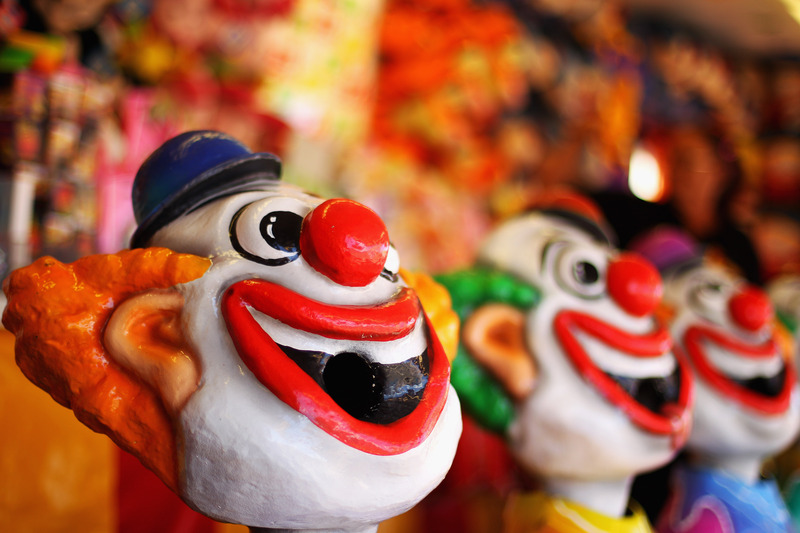 The Wasco clown is only the latest in a long line of similar stalkers, which have been spotted everywhere from Staten Island, New York to Northampton, England. Prepare for the clownpocalypse now, in case — God forbid — your city is next. First it was one clown in Wasco, and then copycats started cropping up. Now, according to the Independent, 16 sightings were made since Friday. And the clowns are no longer just silently walking through the night carrying balloons. Some have reported seeing them wielding machetes, baseball bats, and even a firearm. Law enforcement in Bakersfield arrested a 14-year-old evil Bozo last week for terrorizing a group of teens. But there are many more out there, including the, well, ringleader. After reports surfaced that the police had started cracking down, the person (thing?) behind the Wasco Clown Instagram account posted a pic of yet another terrifying clown along with the caption, "It's funny you guys think I got arrested." Aaaahhhhhhh! A clown started terrorizing the streets of Staten Island this past spring, once again carrying some balloons — you evil clowns should maybe try branching out. According to the New York Post, the Staten Island clown was part of a publicity stunt orchestrated by a local horror film production company. Because clowns are apparently the least original things on earth, another clown appeared in New York City in July, this time in Brooklyn's Greenwood Cemetery, and he, too, had balloons in tow. Sigh. You clowns are starting to bore me. This takes us back to the Wasco clown, who at least is trying something new with the alleged machetes and whatnot. Wait, no, I take it back. Bring back the balloons! Last September, the English town of Northampton was shaken to its core by the presence of a mysterious clown — just like the Wasco clown — who wandered the streets after dark with a bundle of balloons. The Northampton clown insisted "I wasn't trying to scare anyone." OK, except you were dressed as a killer clown, so nope, don't buy that. Two months after the Northampton Clown appeared, a similar, Pennywise-looking clown popped up in the nearby towns of Mansfield and Chesterfield. And yup, the Mansfield/Chesterfield clown also clutched a bundle of balloons.